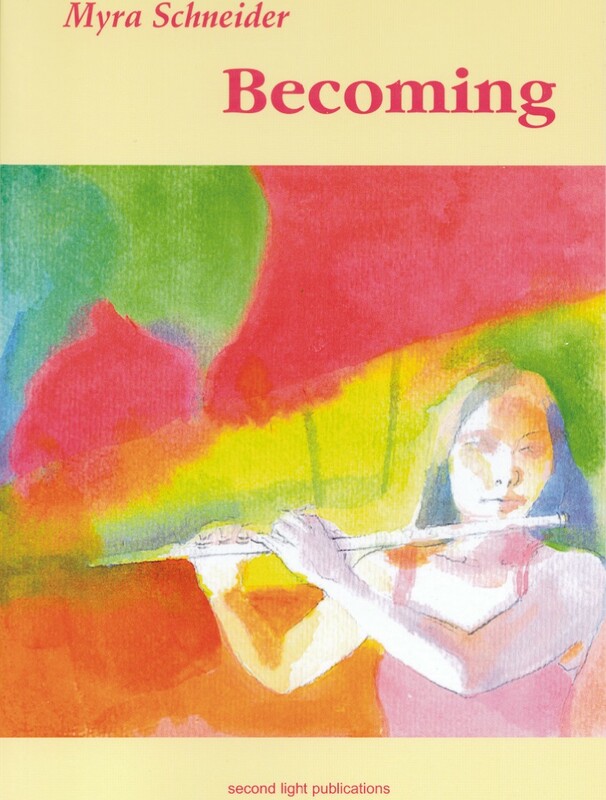 My book-length narrative poem 'Becoming' was published in March 2007 by Second Light Publications. Here are details about the book. Clary has left the professional music scene where she was dominated by her controlling father. The poem follows her as she carves out another career and explores new relationships. Other women in her life are also at a watershed. The theme of the poem is women of different ages finding themselves. Becoming - or the politics of painfully piecing together a self and practicing your art in a world largely shaped by men. Myra Schneider's vigorous narrative poem encapsulates the psychological, social and yes, political pressures that women experience when trying to establish a valid and satisfying life based on the practice of any art form. Because this is a vivid story with characters who leap off the page; because it emphatically doesn't preach or offer solutions and because it lays bare the complex muddle of history and pressure at the root of one woman's attempt to find herself in her art, it's a must-read for those of us who ruefully recognise the central struggle. You'll notice that I don't say 'establishing a career in the arts.' Is Clary, centre of this story, whom we first meet in the silent music room of her school, where the instruments are 'mute mouthed' simply avoiding the brilliant career as a 'top musician' that could be hers, because she has fled form her father's pressure? Is she like the flute in her own dream, iced up? Or is she quietly trying to live a different kind of life, one not equally valued by the world but soaked in the values of music an musical communication? I can hear the emptiness in the corridor. in the dream I struggled from at six. even while he was gobbling a jammy scone. Now touch the piano's yellowed keys. The book is available from Second Light or from Myra for £5.95 post free.